“Hunger Is NOT A Game” Food Drive! The Harry Potter Alliance and the local chapter, Dumbledore’s Army of Delaware County are working to fight hunger globally as well as locally. 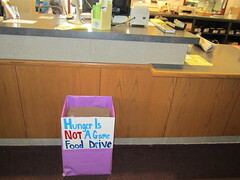 They have set up a food drive collection at the service desk of our library, to coincide with the release of the new “Hunger Games” movie. Please give non-perishable food! The food that we collect will be donated to the Delco Interfaith Food Assistance Network. The drive will continue at least through early April.